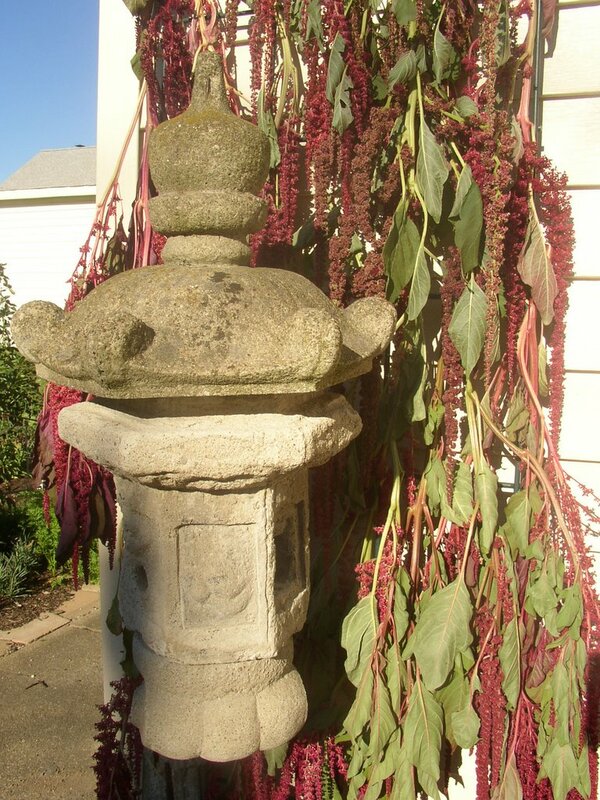 In a recent comment, Judith asked me how my amaranth had dried--I posted about tying some broken stalks to a wire trellis behind my Japanese lantern a few weeks back to see what would happen. Well, that amaranth is definitely dry! It turned a lovely golden wheat color, which is not quite what I was expecting but beautiful nonetheless. It really surprises me that the sun bleached it out so much because I had taken a few of the broken branches indoors to dry on coat hooks in my entryway at the same time. The flowers on those stalks, from the same 'Hopi Red Dye' plants and already bone-dry, stayed approximately the same shade of red they sported when I hung them up. I will definitely shade-dry a few more branches for autumn arrangements, but I'll also leave the sun-dried ones up on the trellis. They add a bit of the natural and organic to the cement-and-siding area over there, and fall is in the air so they're showing appropriate color for the season. I might tie up some spent sunflowers, too, to complete the look. Has anybody ever left the flower stalks to dry outside, or not pulled the plants out until the following spring? 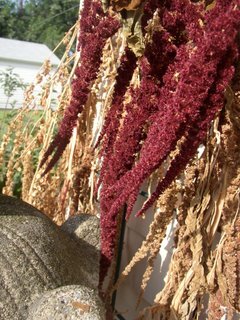 I'm curious whether the birds will eventually find and eat the amaranth grains. I would love to hear from someone like Sigrun, Harvest or anyone else who can let me know whether to expect a few new bird visitors... or not! Obviously I didn't learn my lesson about moving plants in August, because I was at it again tonight. I'm trading two of my extra hosta for starts of two (or maybe three) from the large plant bed at work. 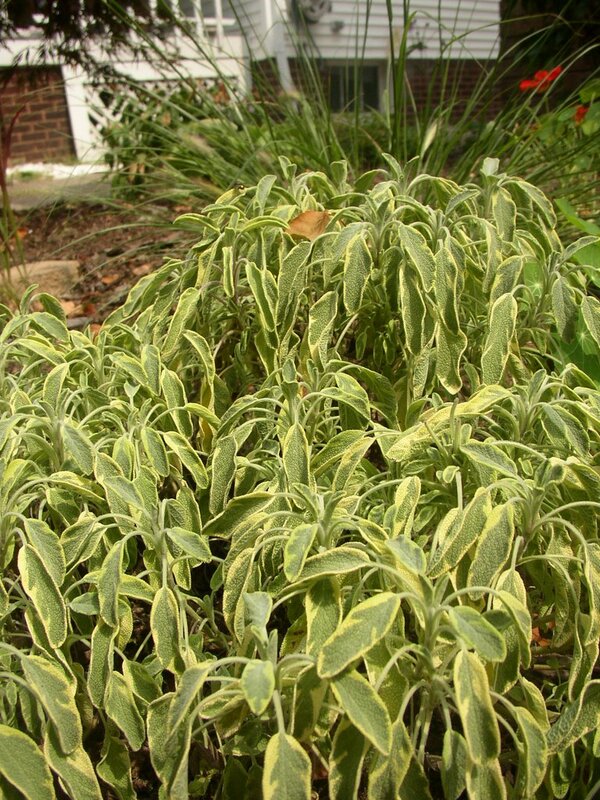 I'm excited, because I am getting a chunk from the huge 'Sum and Substance,' the shapely and upright 'Krossa Regal,' and maybe even the small, rounded, satisfyingly dark green hosta that I have yet to identify. I was digging up one of my trades when the cuff of my jeans snagged an anchor of a very large spider web. This poor girl got taken for a ride as my careless step caused her to swing back and forth... I marveled at how strong and elastic her web proved to be. It even stood up to my clumsiness a few more times when I brought the camera back and began to circle her, looking for a good shot. I say "she" when referring to this spider because the females grow quite a bit larger than the males, who top out around 3/8 of an inch, and this spider's body was almost 3/4 of an inch. With her legs included, she easily measured 1-1/2 inches or more. I never did get a great shot of her from the front, but if you want to see a really wonderful close-up view, check out this one that Yvonne posted last week. The pic of her underside is neat, though... her markings are even more intricate there. 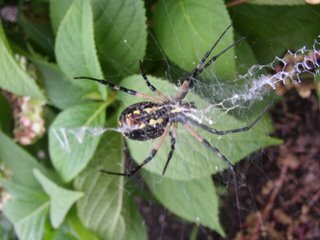 What I found fascinating in researching them online was that they have 3 claws on each foot to help them handle the silk while weaving--I never really thought about spiders having claws before. She's not as threatening as that sounds, or as she looks, though. Their venom does not really affect humans and they will only bite people if they're being harassed. They catch everything from aphids on up in their webs, and have even been known to take out a grasshopper or two. 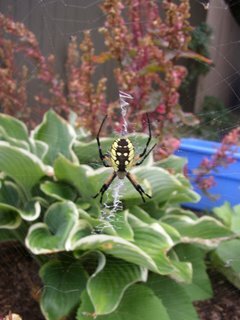 Spiders generally make good garden allies, so I'll be leaving her anchors--er, the dead sunflower stalks--standing until she leaves or is eaten by the birds! 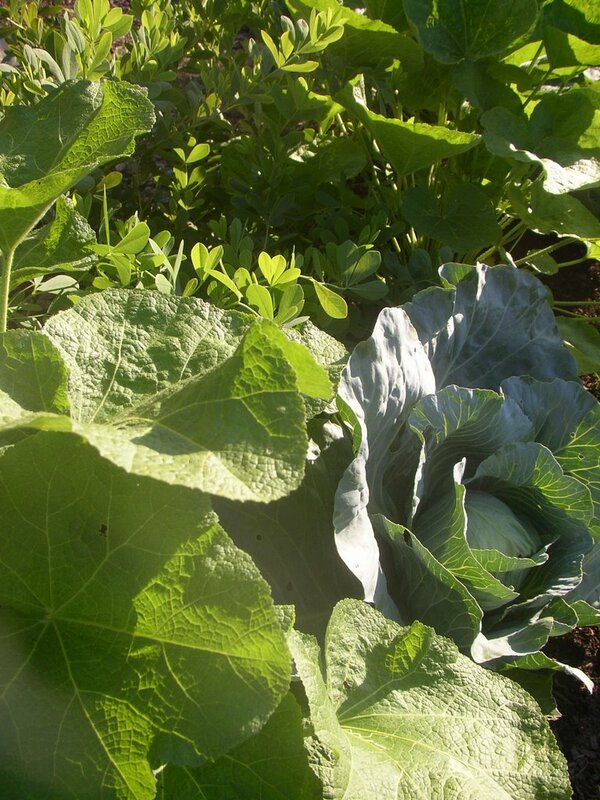 Celebrate Kitchen Garden Day today! 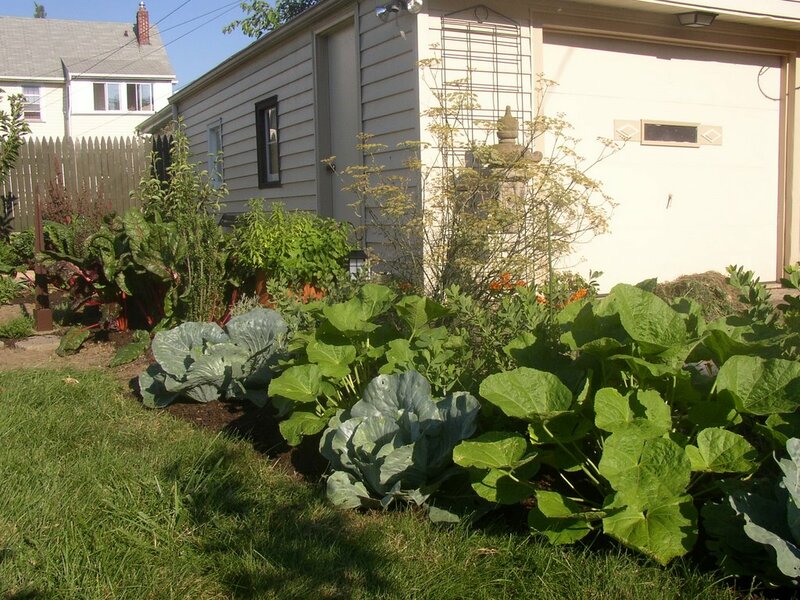 Take a garden tour, eat at a restaurant that utilizes local produce, or simply enjoy the bounty of your own kitchen garden. I have already enjoyed ripe volunteer cherry tomatoes as part of my lunch. Tonight for dinner I will saute some of the lovely 'Rhubarb' chard you see here in olive oil and chopped garlic, and serve it over whole wheat pasta along with grated asiago cheese. I have begun enjoying a cup of herbal tea before bedtime each night, and will either be making a mug of black peppermint, mixed sage, or sage and lemon thyme tea later as well. Tea from your own garden is such a simple pleasure, but immensely satisfying. I have a mental note to add more teaworthy herbs to my garden next year. Let me preface this post by saying that yes, I KNOW you're not supposed to move plants in August. I know that moving them in late summer adds insult to injury because of the usual summer drought/heat combo. I know all that, but it was nice and rainy--the unending, misty drizzle that plants seem to especially love--and around 70 degrees last Saturday. I'd been bitten by the fall cleanup bug, the weekly forecast showed daily rain, and I had some ideas on new locations for several plants so I decided to go for it anyway. I dug with abandon, removing the centaurea dealbata that has been a marked plant for the past year. I transplanted 3 pennisetum 'Hameln' that were Bluestone Perennials purchases last fall, many clumps of chives, a couple of golden sages, an unnamed hosta, 'Crow Feather' tiarella, European ginger, and *gulp* 3 'Hillside Black Beauty' actaea--formerly known as cimicifuga. I really expected that if anything sulked or gave me trouble, it would be the HBB's... just go to any gardening board and ask about moving the actaea/cimicifuga clan and you'll get replies from a bunch of Chicken Littles about how the sky will definitely fall if you try to move these plants at all, ever. If I sound less than threatened by these prophecies, it's because I've moved all of mine several times in the past few years with absolutely no consequences. I have had no problems so far this time, either, as you can see from the first picture. The promised rainfall never materialized this week, so I did water them twice when the flower stalks started to droop a bit. 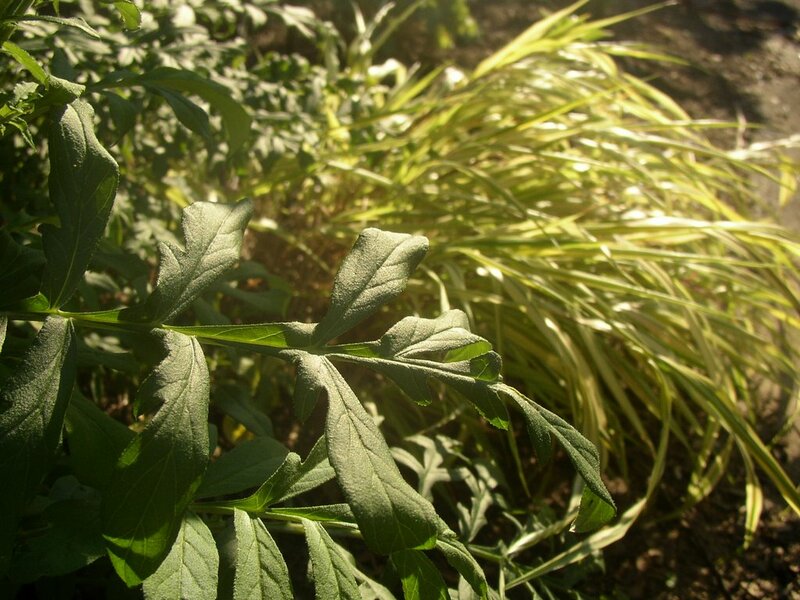 What really surprised me was the reaction of 'Icterina,' the golden culinary sage. I checked it out Sunday and found the leaves all hanging straight down! You can see in the second picture that the leaves are still droopy--and this is after watering 2x daily for a whole week! I know that I got a huge chunk of the rootball, and I actually moved it into slightly less sun than it had previously enjoyed... so I'm really not sure to what factor I should attribute its sulkiness. I'm just surprised to find that behavior in an otherwise tough sage. After all, I hadn't been worried about moving this one at all! Is some sort of Murphy's Law of Moving Garden Plants in effect here? 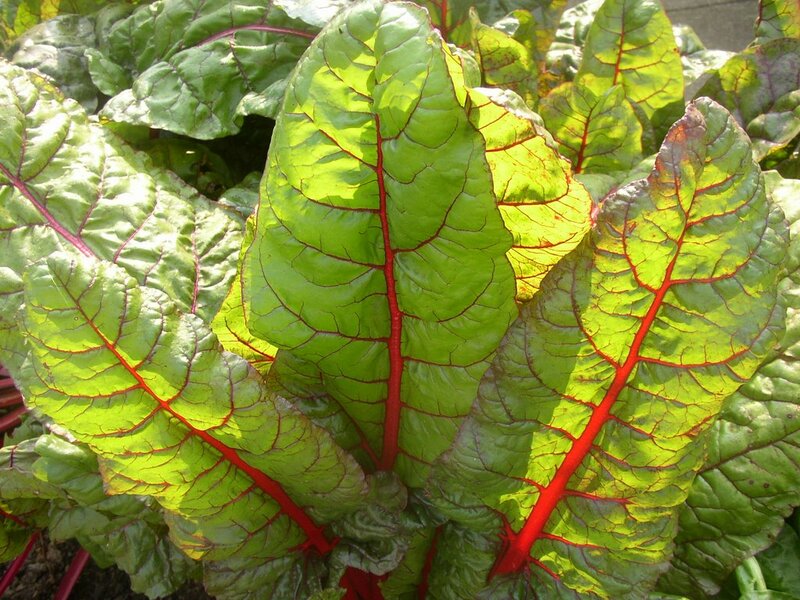 "Murphy's Law of the Garden #113: "The plants you are hesitant to move will bounce back just fine, but the ones that you assume will easily survive transplanting will try to die on you." There's probably another corollary to that law, now that I think about it. One that says something about how if all other things are equal, the plant that cost the most will be the one that dies. I think that's happened to me a few times in my old garden. Good thing I got my HBB's for cheap during a Wayside Gardens sale, or they might have been goners, too! ... for you, Mom. Why? 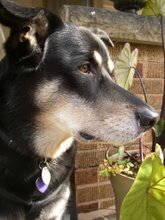 Because your son is flying to Japan tomorrow, and if I know you at all you're probably needlessly worrying already. Because you definitely seemed to want to see something "prettier" than my slug post. Because I love you. 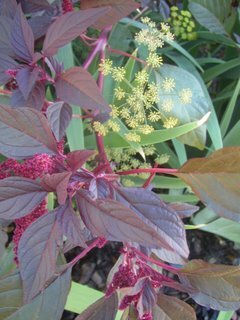 The red amaranth and the hosta leaves are scentless, but the bronze fennel, culinary sage, and golden sage are all quite fragrant. It's not as top-heavy as it appears in this picture, either. I couldn't get a good picture of it in the dining room so I set it on the driveway in the fading rays of the sunset, in front of the silver artemisia. Not the best background to set off the arrangement, but I was more worried about the light. 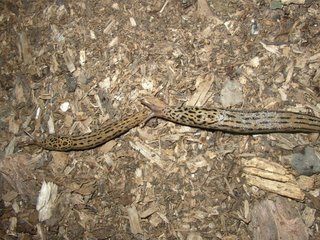 These two were practically attached as they traversed the mulch in my garden--and yes, they're each about 4 inches long. We grow 'em big here, unfortunately. As tends to happen lately, I dropped what I was doing and ran inside for the camera. Once pictures were downloaded, I hit Google and typed in "slug mating" on a hunch that a little slug lovin' might be what I was witnessing here. I must have happened upon mere slug courtship, based on some of the fascinating pictures I found on the subject of "Aerial Slug Mating." Yes, really. They apparently like to hang from a rope of slime to mate--perhaps the slug version of the mile high club? If you're squeamish, the pictures on the link above might gross you out a little... but if you have a rather childlike curiousity about the natural world the pictures are absolutely fascinating. Serious gourmets (like Steven over at Dirt Sun Rain) will probably laugh at my feeble attempts, but I spent the better part of today making and freezing herb butters for use in the early winter when I need a from-the-garden gourmet indulgence. Yesterday, while shopping at the historic West Side Market in Cleveland, I stopped at AnneMarie's Dairy to pick out a treat or two. AnneMarie carries Ohio maple syrup, Ohio wildflower honey, Ohio-made organic cottage cheese (delicious if you ever get to try it--it's almost the consistency of feta and has a more "sweet cream" taste to it), organic molasses, and other random items that always get me into trouble. From a socio-political standpoint, I like to buy things from her just to support the fact that she carries a lot of local and organic items... but it's a win-win proposition because what she sells tastes so good. While waiting for AnneMarie's helper to finish ladling liquid over my 1/4 pound of French feta, I spied their huge chunk of butter and a light went off in my head. I used to make chive butter at the old house, but lack of time, the newness of my herb garden, and plain old forgetfulness have conspired to prevent me from doing so here. I have been trying to figure out ways to preserve more herbs this summer, so I added 2-1/2 pounds of butter (salted, upon AnneMarie's recommendation once she found out what I was doing with it) to my order. That sounds like an awful lot of butter--looks like it, too, when you're carrying around something the size of a large Velveeta box!--but it is used in small batches for each flavor combination. I freeze the individual batches in tightly folded squares of wax paper and then toss all of the butter packets into freezer bags once they harden. When I need a special indulgence this winter, I'll defrost a packet and use it to jazz up standard baked potatoes or serve it on homemade bread for special company. 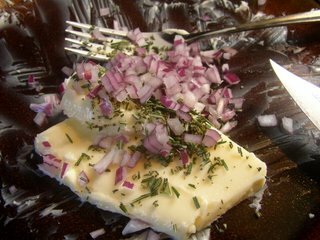 You can probably find a bunch of other "recipes" for herb butter if you search the web, but I've found that using about 1/3c. of butter to about 3 Tbsp. of flavorings works well. Today I used various combinations of sage, tarragon, thyme, rosemary, red onion, and garlic. 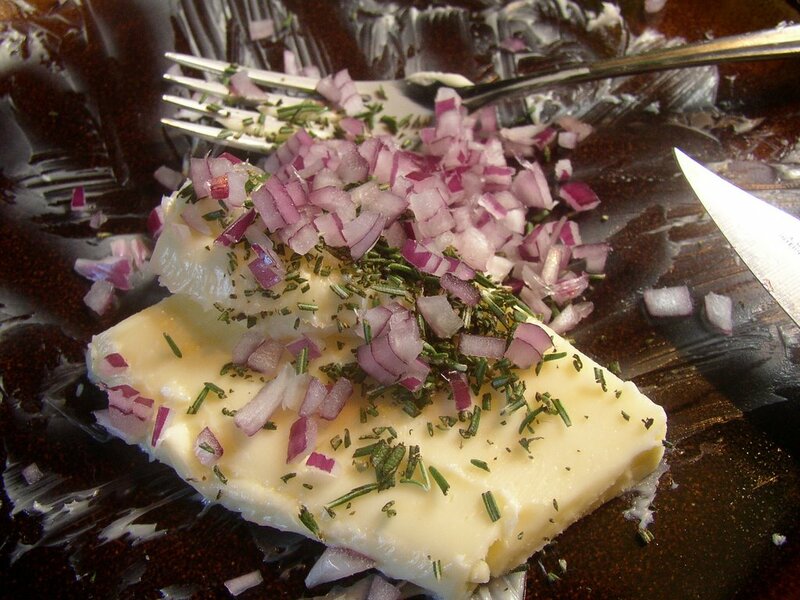 I tried the sage/rosemary/red onion blend just now on a piece of French bread and it's amazingly good--I did discover through the course of the day that the finer you chop the "tougher" herbs like rosemary and sage, the better, though. You don't want the herbs to add texture to your butter, just flavor... adding flavor and eating well is one of the main reasons why I garden. Some day, I'll create a wonderful water feature... but not in my current yard and garden. I know that there are small water features you can build, but I would want something large enough to support beautiful water plants and a whole mess of koi. Since that's not going to happen in my teeny tiny lot, I opt to forego water features in lieu of lush plantings and lots of edibles. In the meantime, pictures from Uncle D and Aunt B's pond will feed my envy--er, allow me to enjoy a water garden without actually having one. 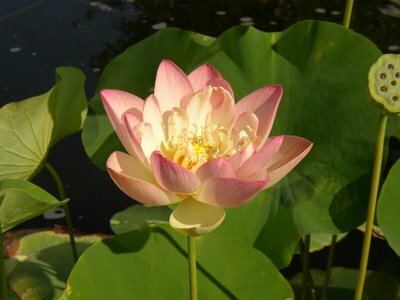 The above is their first lotus blossom of the year. If I hadn't seen the bud on it during my last visit, I would wonder if D grabbed a stock photo to email over in an effort to put one over on me. It just looks too perfect... but I guess that's what the lotus is all about, right? Good thing I look good in green. 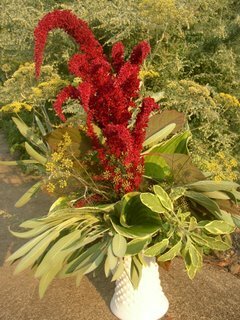 No, not the bouquet--this is the amaranth and fennel bouquet that I couldn't post Sunday. My garden gift was much, much better than mere flowers: A pair of #7 Felco pruners. I have never actually used a pair of these babies before, but they have a cool rotating handle and the blades pass each other smoothly with barely a whisper and no light between them. I'm now wracking my brain trying to figure out what I can prune. Seriously. I may have to solicit some of the neighbors to see if they have anything I can cut down just to try them out! 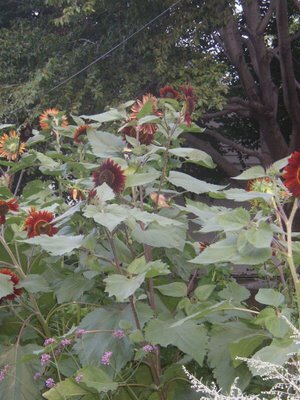 As for the rest of the garden, I have no idea how it fared while I was away--I arrived back home after dark and couldn't discern much in the light of the garage-front flourescents. I'll have to report on that tomorrow. We occasionally get strong Lake Erie winds here in the northern Cleveland suburbs, sometimes gusty and sometimes sustained. 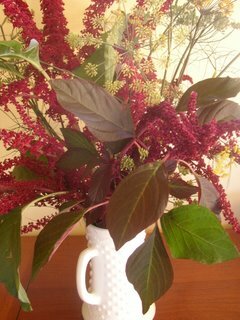 On Friday, I came home to find that gusts had knocked over some of my most top-heavy 'Hopi Red Dye' amaranth plants. Stems were twisted and broken, and the upright panicles were horizontal to the ground. Yesterday, I cut down all of the broken pieces along with those top-heavy stalks that remained upright but looked rather shaky without the support of those stalks that were culled. All is not lost, though... as you can see in the first picture, some of the remaining stalks still have small flowers. In this pic they're combined with the yellow umbels of bronze fennel and the swordlike foliage of irises in the garden. 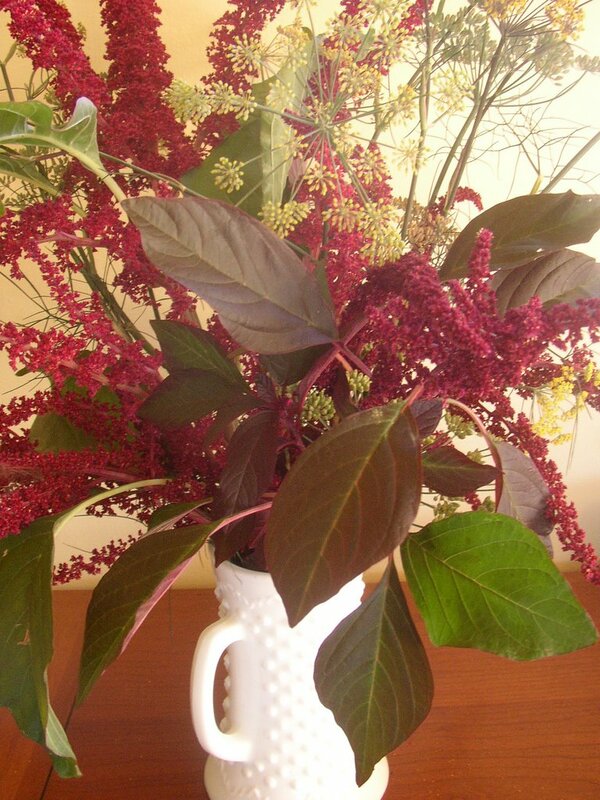 I liked this combination so much that I brought a bouquet of fennel and amaranth inside and loosely arranged it in an old milkglass vase from my grandma. I got two pictures of it before my camera batteries died and I discovered that my backup set hadn't been recharged yet from earlier in the week. Argh. I'm not sure how decorative the amaranth will be when it dries, but on a whim I tied the cut stalks to a recently trashpicked metal trellis to dry. The trellis sits behind the Japanese lantern that I got for just a few bucks when a local garden center closed down, and it adds some much-needed color to the boring beige garage there. I love taking pictures in the evening, when the warm light makes everything glow without washing out colors. It adds a richness that makes even my questionable photography look good. Hakonechloa macra "aureola" with the fernlike leaf of centaurea dealbata. 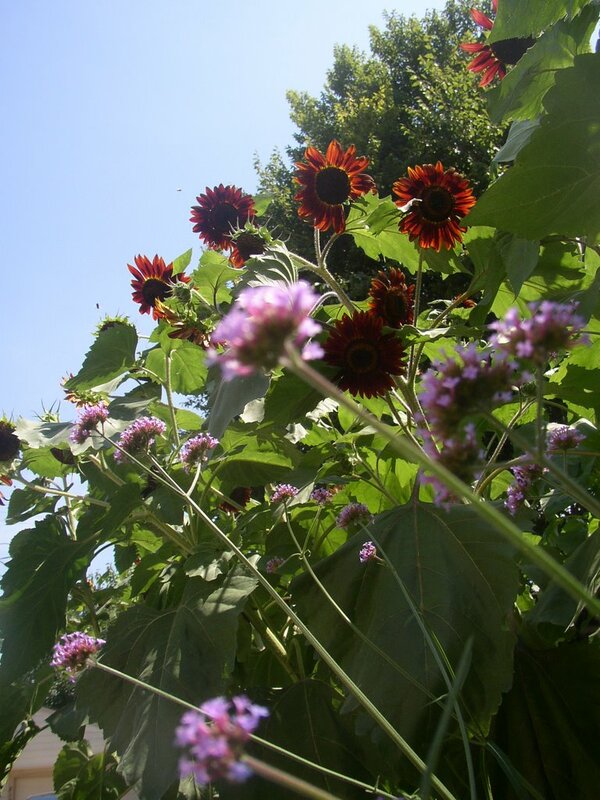 Verbena bonariensis in front of my sunflowers. Thanks to Karen's astute observation that my sunflowers had different colored stems, along with the progression of a few of the earlier flowers, I can now I.D. them. The darker red ones with the dark stems are my 'Cinnamon Sun' and the ones with green stems and flowers fading to orange are 'Cappucino' sunflowers. I wasn't going to do sunflowers again next year, but I can't resist the birds and bees along with those big, dark red flowers. 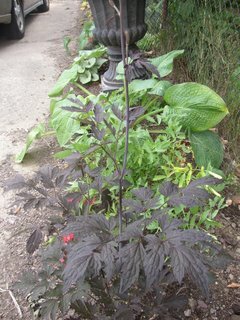 So I think I'll try to winter sow some 'Chocolate Cherry' which will come from the same company who packaged the 'Cinnamon Sun' I planted this spring. And as long as I keep it to one variety at a time, I'll know what I'm showing on my blog! ... but as usual, I digress. Back to the plants. This part of my backyard is very narrow, and it's a pain to have to turn the mower around in such a tight space, so the grass in the foreground will soon be sacrificed for a path that leads back to the Japanese rock garden. You can kind of see on the left where I have started to lay the flagstones. They're in the dirt, with some thymes already planted around them. On the left of them (out of the frame) is an espaliered apple tree underplanted with borage and flanked with two blueberry bushes. The rest is a hodgepodge of culinary herbs like sage, lemon verbena, and lemon balm (planted safely, I hope, in a chimney tile)... edibles like cabbage, swiss chard, carrots and red onions... perennials like hollyhocks, false indigo, asclepias tuberosa, salvia, dianthus and Russian sage... and even a couple of ornamental grasses and a "Sky Pencil" holly. The hollyhocks are only there because my winter sowing was a little more successful than I had expected, and the cabbage were a coworker's extras that I brought home. All were plopped as filler while the baptisia is still small. There are a bunch of other transient plants in the list above, too, so this won't look the same next year at all... and as much as I am enjoying it now, I'm looking forward to its next incarnation, too. Step, click, step, click... I used a slow, methodical approach and tried to get ever closer to these finches as they dined on my sunflowers last night. I had apparently just gotten too close for comfort for Ms. Finch, though--you can see her in the middle of the picture, about to take flight. Her man, whose back can be seen two leaves up and a little to the left, shortly followed. If you have trouble finding them, click the picture to see a larger version. They sat on the power line above for a minute or two, chirping up a storm as they waited for me to leave. I have never heard finches before and I don't know what I expected them to sound like... but I was surprised by the urgent, high-pitched, repeating song. It sounded rather more like my smoke alarm in need of fresh batteries, performing at a rave, than anything else! So they were not quite the vocal entertainers (at least in my garden) that the mourning doves, cardinals, and robins are. I've heard better versions of their songs online, though, so I'm willing to give them another chance--and if nothing else am amused at watching them decimate my sunflowers through the kitchen window! 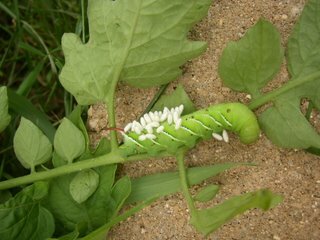 I finally started digging in the mowing edge today, and was working around the tomato plants when I found it: A tobacco hornworm. 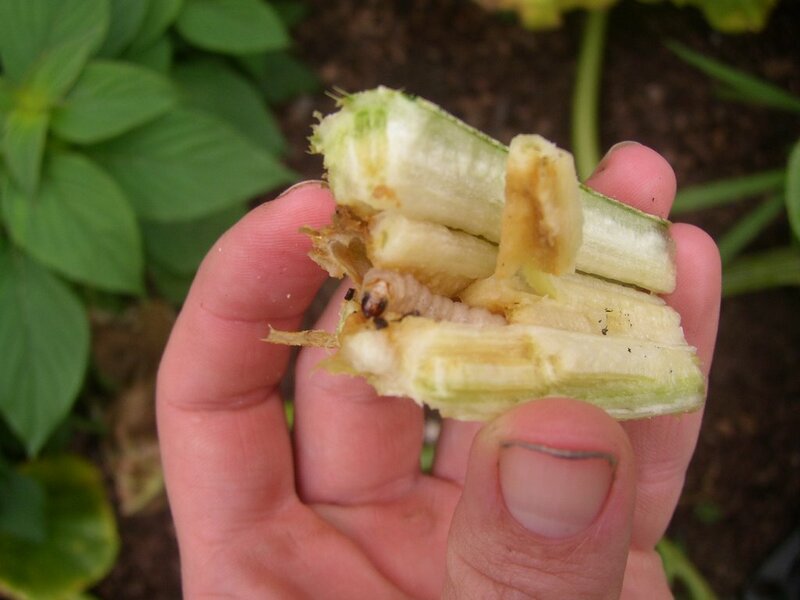 Tobacco and tomato hornworms eventually become cool-looking hawk and sphinx moths, but at this stage of their lives they will decimate your tomatoes, peppers, tobacco, and eggplants. My first inclination was to take him over to the driveway and squish him. I wasn't quite sure what was up with the little cottony hangers-on, though, so I decided to come inside and do some internet research to figure out whether this was a normal sight or whether I had yet another pest to deal with in the garden. I'm glad I did my homework, because the little white things are the cocoons of small braconid wasps, a.k.a. parasitic wasps--in this case, most likely Cotesia Congregata since since hornworms are their favorite hosts. These parasitic wasps lay their eggs inside the skin of a young hornworm larvae. 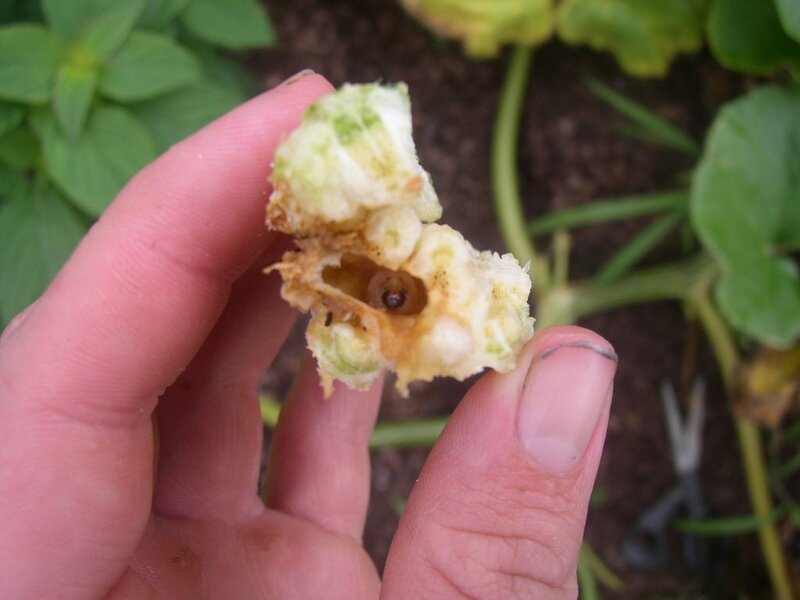 Their babies feed on the insides of the hornworm until they pupate into the cocoons you see above. Once they emerge from their cocoons the new adult wasps will fly off to find mates and start the parasitization cycle all over again. The hornworms do not survive the raising of these parasitic wasps, so it's best to leave hornworms in the garden if they have cocoons attached. In effect, the hornworm is already doomed and by leaving the cocoons to hatch you will be raising some beneficial insects to help you fight future garden pests. I don't know what's up with me finding all of these bad bug/good bug combos this week, by the way. But I'm sure getting good use out of one of my favorite books for garden bug identification: Garden Insects of North America by Whitney Cranshaw. One thing that I love about gardening is that a good surprise seems to balance out every disappointment, as long as you keep your eyes open to see and your heart open to experience the wonder around you. 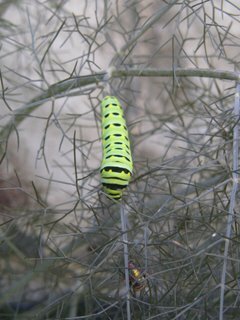 This morning, as I picked up a piece of trash that had blown into the garden overnight, I found two bright and beautiful black swallowtail butterfly caterpillars. Even I am amazed at how quickly my disappointment over the squash vine borers dissolved in a wave of childlike delight. 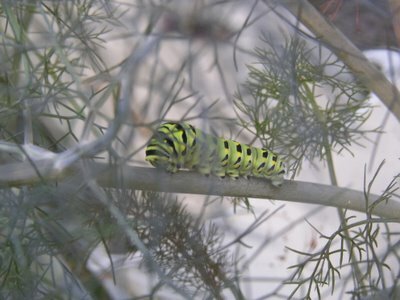 Unfortunately, these two have hatched on the same small bronze fennel plant, which I allowed to grow in a crack between the house and the driveway. 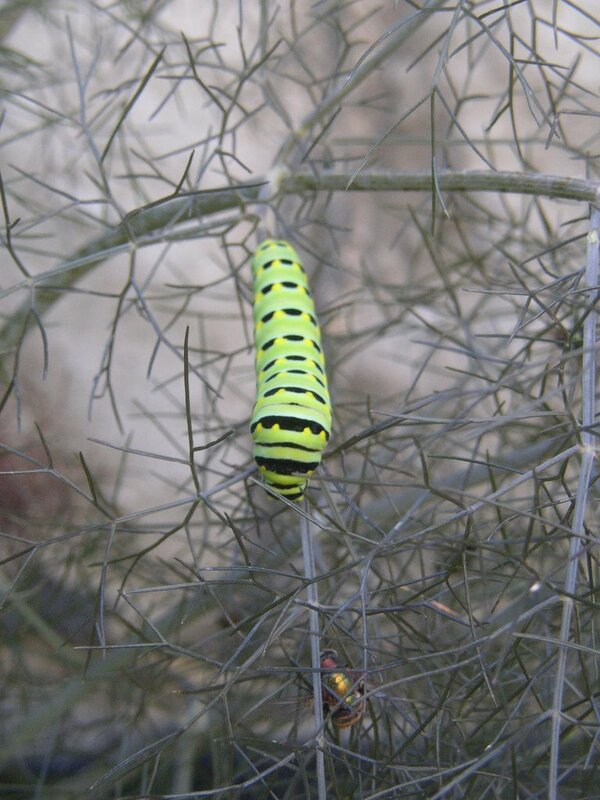 Fortunately, I have lots more bronze fennel to feed them if need be. If my boyfriend finds the old aquarium that he swears he has, we may bring one or both inside to help raise them. Otherwise, I'll keep my fingers crossed that they turn into beautiful butteflies next year. "How does one become a butterfly?" Special thanks to Brian for taking these wonderful pictures this morning. I was checking out some of my favorite blogs the other day when I happened upon some pictures posted on Dirt Sun Rain. 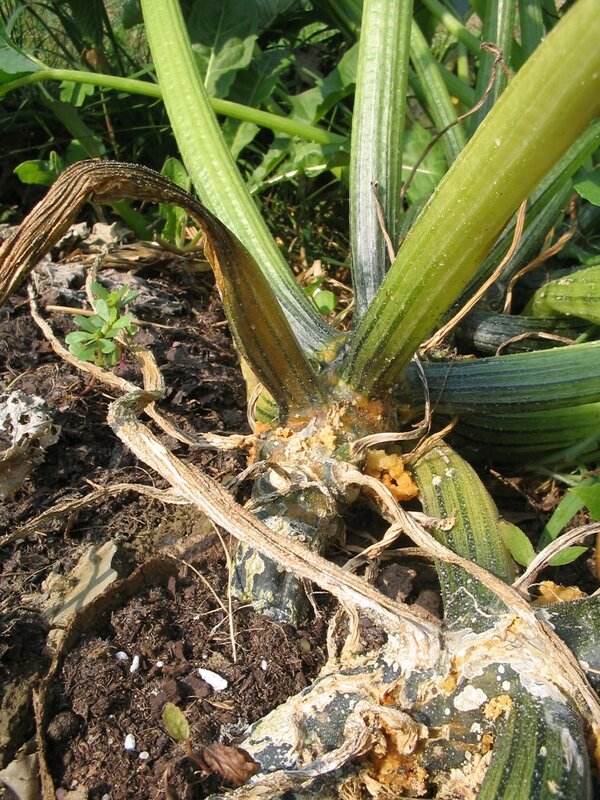 As I looked at a picture of Steven's decimated zucchini vine and read the accompanying text, my heart sank. 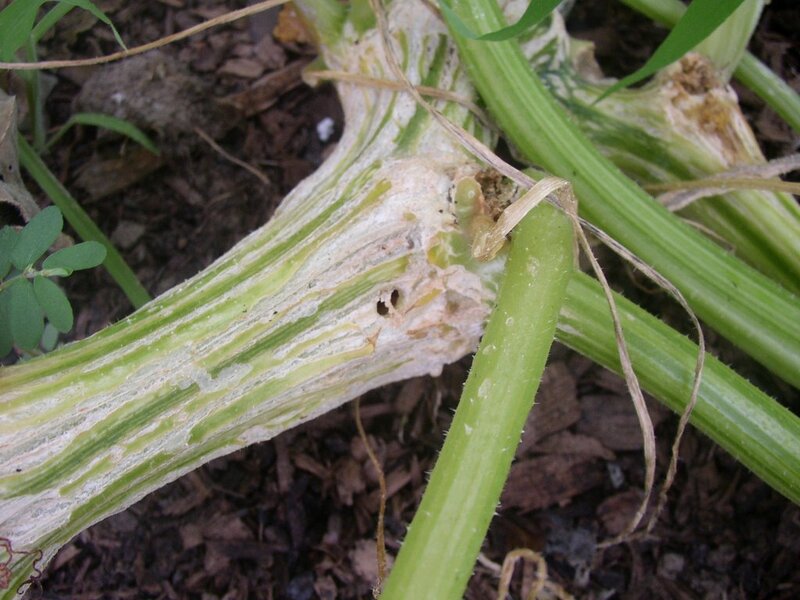 The squash vine borer damage he mentioned looked an awful lot like what I had seen on my own zucchini a week or so ago, before I pulled it. My favorite reference for state-specific gardening information is OSU's "Ohioline" website. There they post Ohio State Extension Office "Fact Sheets" on various edible and ornamental plants, and their library is rather extensive. 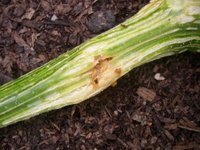 Ohioline was my first online stop, and of course the squash vine borer had merited its own fact sheet. As I suspected, pumpkins and other squash were similarly susceptible to this pest. According to OSU, the moths themselves are active throughout most of June. They lay oval, flat, dull-red eggs that are about 1mm in diameter, and these eggs hatch into the larvae that bore into the squash vines. The entry holes are clearly visible, and I'm posting two examples of them here. Most of the entry holes have a "sawdust-like" ooze coming out of them, as the second picture shows. The two holes in the first picture are surprisingly clean, however. Maybe they're just older? 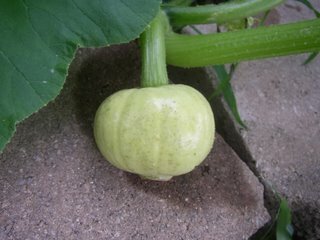 When I found these holes, and many others like them, I figured that my 'Jaradale' pumpkin vines were probably toast. Ohioline recommended a few different plans of physical and cultural attack for dealing with these pests in small gardens, but none of them would work for me at this point. 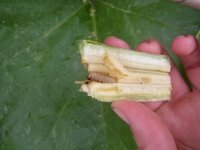 So I decided to cut open the stem and have a look at the beastie within.